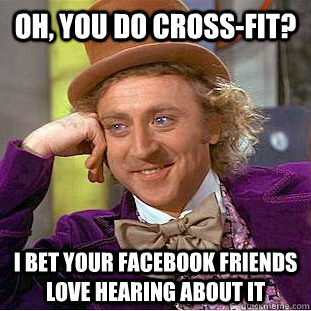 Yes, dear reader, I do Crossfit. I know, I know. I don’t do Crossfit because I bought the gospel. I think the whole thing is a bit dubious. The faux-patriotic thing. The not-focusing-on-one thing approach to training. That annoying obsession with stupidly named workouts. And so on. I never heard of it until a couple of years ago, but when I had done the paleo thing for a few months I realized there is a Crossfit gym (sorry, I won’t call it ‘box’) two blocks from my apartment. I used to half-heartedly lift weights in my thirties, in a regular gym and at home, but I didn’t really have a clue and I didn’t get very far. I thought getting more serious about exercise, beyond walking, running and cycling might be a good idea. So I joined. I sucked pretty bad at the beginning and then I got slightly better. And now, almost two years later, I haven’t really improved much. My personal records have mostly stood unchanged for a year or so. Given that I’ve done Crossfit three or four times a week, all out, for 21 months that looks like epic failure. Failure on my part? Failure on my coaches’ part? Failure on Crossfit’s part? 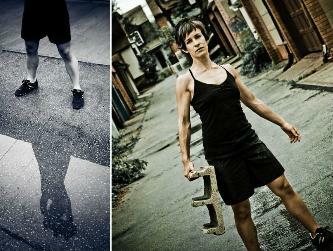 Weirdly, I actually look pretty muscular now; more muscular than some of the much stronger women at the gym. Maybe because I’m relatively skinny, so it shows more. But my (now discarded) scale said my body fat percentage didn’t really change. I used to get really depressed after workouts (I refuse to call them WODs), wandering home ready to burst into tears, when I’d attempted some heavier weight and failed miserably. It wasn’t for lack of trying. I was angry with myself for not getting better. I’m sure my coaches were a bit frustrated too – they’d given me a lot of extra attention, and if it wasn’t working, it either meant I wasn’t trying hard enough or their coaching wasn’t good enough. I used to search for “crossfit failure to gain strength” or “crossfit women plateau” on some of the bigger Crossfit message boards and never find much, which made me feel worse. Was I really the only person out there for whom Crossfit wasn’t working? Now, it could well be that this is really a case of technique, and chances are that if I adopted a more rigorous program focused on strength like Starting Strength I might actually improve. Get over those half-assed, random combinations at my gym. And yet, most everyone else there seemed to always get better, just not me. But then again, I’ve always been really lousy at almost every sport from a very early age, even though I spent my childhood outside, running, cycling, digging, rollerskating, scootering, building and whatnot. Which made me think there had to be a genetic component. And it does turn out that some people are exercise non-responders. Which makes me think that I might be one of those people for whom exercise does not lead to many measurable changes. But why do I seem to be the only one so afflicted among the many people at my gym? Well, the penny dropped about half a year ago: survivorship bias. The people for whom Crossfit does not lead to measurable improvements tend to drop out and choose some other kind of exercise. New people start all the time, but only a few become regulars. In other words, I am the only idiot who doesn’t get measurable improvements and keeps going regardless. That changed my thinking completely. I still go, I still don’t make any “progress”, my coaches still give me the ‘sad’ face whenever I fail at my attempts to get to new personal records. But I absolutely, totally do not care. I am not interested in any serious strength programs – I get obsessive about stuff, and the last thing I need is yet another thing to get obsessive about. Crossfit is a decent workout, it’s fun, the people are nice, the gym is two minutes away. I give it my best, and then wander home and do something else. It’s not part of my identity. I don’t do the weird lingo. It’s just exercise. An invitation to never stop questioning all the beliefs you hold dearly. Chances are, at least half of them will turn out to be wrong. If your identity becomes too wrapped up with them, you’ll either end up demoralized or deeply wrong. I come from a long line of people who built their lives on grand explanations of everything, and then spent years sorting through the wreckage. Life is messy and whatever truths there are don’t take the form of bumper stickers, memes or Pinterest platitudes. This post is really a tribute to one of the bloggers I’ve been following for 11 years. Most people will take a few wrong turns in that long of a time, and if you slavishly follow them they’ll take you down with them. Krista‘s been a critical thinker, a skeptic, a learner, a hater of dogma, a rejector of certainty and just a general badass. Here is an edited list of some of her thoughts on turning 40. The full list is here. Being addicted to “a solution” is just as fucked up as being addicted to a substance. This is characterized by rigid all-or-nothing thinking (“If I eat one cookie, I’ve failed”); shame and guilt (“I hope nobody finds out I’m a bad ___ and a fraud”); cult-like devotion and fanaticism; self-righteousness and intolerance (“Diet X is good, and if you don’t believe that, you’re an idiot”); along with reductionism and over-simplification (“Everyone should do Workout Y”; “Food Z is the answer”). If you find yourself obsessively seeking, information-gathering, surfing blogs and websites, arguing your point of view on the interwebs, analyzing or ruminating over your “issues”, and generally in continual “self-helping mode”… your problem-solving behavior is part of the problem.